Not to be nitpicky or inconsiderate to the source material, but it’s keeping that hyphen that cripples this new installment. 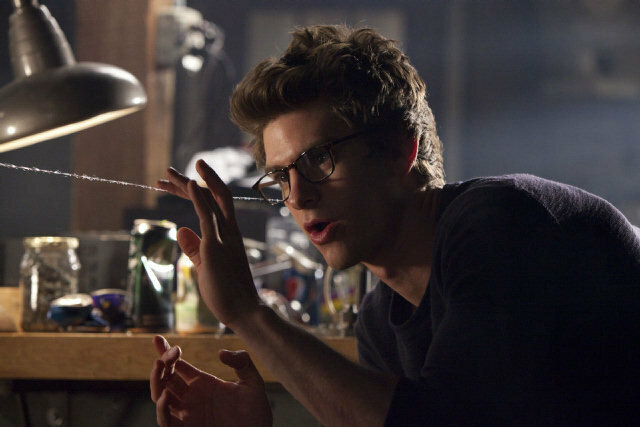 Only ten years after Sam Raimi and Tobey Maguire first started slinging webs and two years after Broadway started singing about them comes The Amazing Spider-Man, a reboot that only makes minor tweaks and changes without leaping on its own. With Maguire and Raimi intelligently leaving the franchise due to the lack of creative motivation (two astoundingly successful films and one dark dud in five years), Sony pursued a fourth film without them, surprising Hollywood with the choice of Marc Webb to helm it. Scoring a sophomore success to follow his freshman indie romance hit (500) Days of Summer sets the bar high— the budget and scale for this film is about ten times larger than his last. Could he instill the same mild white teenage charm and angst to a story that hard already nearly perfected it? To some degree, it appears as if so. Webb and Garfield’s version is naturally a more emotional, personality-driven piece that comes across a lot cooler for the lonely orphan and awkward teenager. Much of that is a nod to Garfield, who masters the identity mythos balance and relationship with Stone. The film’s youthful, quirky vibes, delicately handled romance and cool soundtrack that make the film strong… at times. Webb can pace and frame a wonderful close-up, but there’s usually nothing heavy enough to note. Dazzling CGI and 3D masks the film’s low moments. Don’t be fooled— a dreadfully boring and unconvincing (both narratively and visually) villain makes it hard to get through the uninventive action sequences. Here, Webb’s weaknesses become apparent. There is some merit in Webb’s approach— without completely reimagining or restylizing the character, he’s seemingly managed to make it still feel fresh, entertaining and somewhat clever. But no matter how successful the film is it’s impossible (unless you’ve had the discussion in a Sony boardroom) to gratify your wonder about why this film needed to exist. It’s hard not to ask yourself, “Couldn’t Sony feed these storytellers’ imaginations $220 million to create a project with originality and surprise?” For that price, 22 comparable (500) Days of Summer films could be made (note Marc Webb is two-for-two on movies with stupid punctuation). With that kind of budget, couldn’t they at least come up with a new spin on the metaphor? If you can ignore the arrogance of Sony for wanting to milk more money out of the franchise and ignore the slack in storyline, you’ll at least find a convincing alternative to numbingly dumb avengers, strippers and teddy bears that have dominated this summer box office thus far. This entry was posted in Reviews and tagged Andrew Garfield, comics, Emma Stone, Marc Webb, Marvel Comics, Movies, Spider-Man, Superhero movies, the amazing spiderman by LukeMiller. Bookmark the permalink. Important to note that Sony HAS to keep making movies with their Marvel franchises or they lose them. Expect to see the Fantastic Four and others coming soon, as well!